Sadafumi (Sada) Uchiyama is the Garden Curator at the Portland Japanese Garden. Uchiyama is a third generation Japanese gardener from southern Japan where his family has been involved in gardening for over a century. Prior to his appointment as the Garden Curator in October 2008, he also served as a Vice President on the Board of Directors and continues to serve on advisory committees for the Portland Japanese Garden. Devoted to fostering relations between Japanese gardens in Japan and those outside of Japan, Uchiyama served as one of seven founding members and the Secretary of the International Association of Japanese Gardens (IAJG) from 1996 to 2000. Stemming from his involvement with the IAJG and his vast knowledge in the field of Japanese gardens, he was invited to speak at the 5th International Symposium on Japanese Gardens in Tokyo in September 2007. Since then, Uchiyama has been working on the development and establishment of the North American Japanese Garden Association (NAJGA) beginning in 2009. He was elected to serve as a Charter Member of the NAJGA Board and its Editorial Board. As evidence of his interest to give back to the community, Uchiyama has taught landscape design courses and lectured on Japanese gardening at colleges and other public gardens in various parts of the countries. One may find his written contributions in the Journal of Japanese Gardening, Garden Design, Fine Gardening, Inspired House, Luxe Magazine as well as magazines and professional journals in Japan. 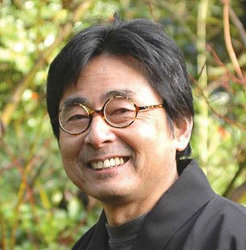 As the Garden Curator of the Portland Japanese Garden, Uchiyama is actively engaged in ongoing public education and regularly speaks at horticultural societies, garden clubs, and schools and professional conferences in Japan and throughout the US. In addition to his background as a gardener born and trained in Japan, Uchiyama is also a registered landscape architect in Oregon and California with a BLA and MLA from the University of Illinois. He has been practicing landscape architecture throughout the US. The traditional apprenticeship in Japanese gardening combined with the formal training in Western landscape architecture allows him to design and build a unique and wide range of private and public landscape projects. His representative projects include the renovation of the Osaka Garden, the site of the 1893 Great Columbian Exposition at Jackson Park in Chicago (2000- to date), and the Shofu-en of the Denver Botanic Gardens (2001-20012). Most recently, he completed Shoun-Kei Japanese garden at Sarah Duke Gardens at Duke University, NC. (2015) and currently working on the Rolex Headquarters in Dallas, TX. in collaboration with Kengo Kuma (2015 to date).